I trained as a Graphic Designer and it’s a truth universally acknowledged that graphic designers are obsessed with typography. I am no exception. I also have a keen interest in papercraft and over the past few years, I have combined these two passions and developed my own version of papercutting, which I now offer as personalised gifts! for away! Perfect for any occasion! They’re bespoke, freestanding ornaments with personal messages – perfect for any occasion! Many of the examples below were cut by hand! Take a look at my range below and see if there are any styles that take your fancy. Let me know what you’d like it to say and I’ll create a proof of how it will look for you at no extra cost. Want to make a change? No problem. Do you have a specific type of paper in mind? I’ll get it for you! And would you like to add a picture or symbol? Sounds good to me! I’m there for you during the consulation process to help you get exactly what you want; as a result, you’ll get a unique product that will blow whoever it’s intended for away! If you want to know more about my range, feel free to peruse my blog, where I go into detail about these designs. 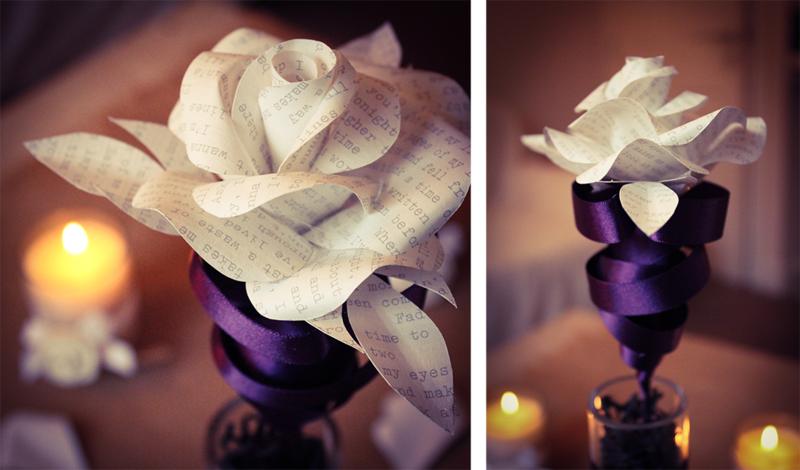 I also create hand made paper flowers! You can choose what you want on the paper – whether it’s song lyrics, pages from a novel or sheet music, it makes for an extremely beautiful and personal gift! You can hear from one of my happy customers here!